Product prices and availability are accurate as of 2019-04-17 06:29:40 EDT and are subject to change. Any price and availability information displayed on http://www.amazon.com/ at the time of purchase will apply to the purchase of this product. Drain Clogs are never fun to deal with and not utilizing a quality tool will make matters worse. With DrainX you won't have to worry. 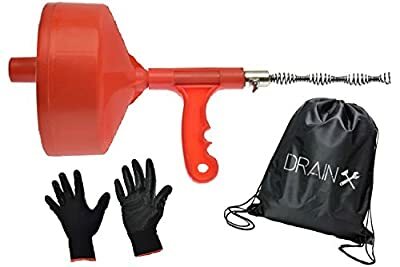 The X in DrainX stands for Experts! We have consulted with professionals around the country to create a product plumbers would use in their homes or during a job. Why are we confident? 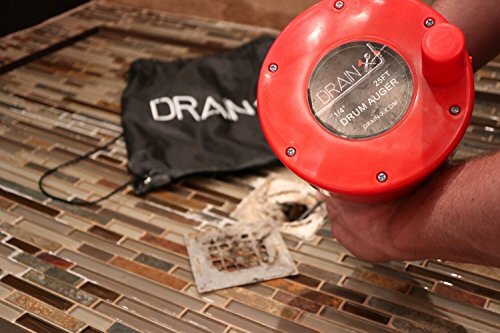 We have done the research and fixed the issues most people have faced with various drain augers they have purchased in the past. The number one issue most customers faced is durability. Clogs come and go but we don't want it to be the case with our tool. We don't expect our customers to purchase a new tool everytime a clog occurs because the tool broke down. With that said, a lifetime guarentee is extended with the purchase of the DrainX 25ft Drug Auger Tool. How to Use: Step (1) Loosen the thumbscrew Step (2) Once the thumbscrew is loosened, pull the snake out and insert it into your drain until the clog is reached. You don't want the tool sitting on the rim of your drain yet. Please make sure there is 4-5 inches of space between the tool and drain once the snake is inserted. Step (3) With the snake inserted, tighten the thumbscrew and turn the drum clockwise using the Knob. This will force the snake to go further into your drain pipe causing a cleaning action. If done properly the tool will sit on the rim of your drain once you have rotated the container a few times. 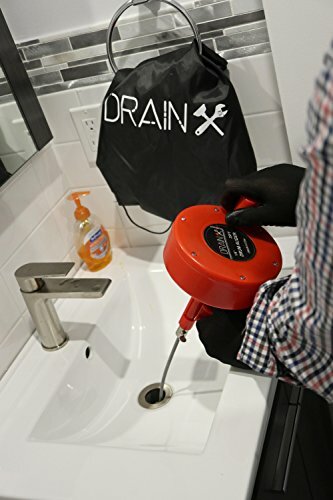 Step (4) Once the tool is sitting on the rim of your drain, loosen the thumbscrew and pull the drum back while the snake is still inserted into your drain. Doing so will bring you back to step 3. Higher Quality, Lower Price: The DrainX 25-FT Drum Auger was manufactured with durability in mind. The drum housing is made of a high quality/impact polymer that will last you for decades to come. This is a tool utilized by novices to master plumbers. 1/4" Dia. Steel cable for use with 1-1/4" to 2" Pipes. Quick Adjustments: The snake is fully bendable and flexible, which makes it perfect for traps, S or L pipes. 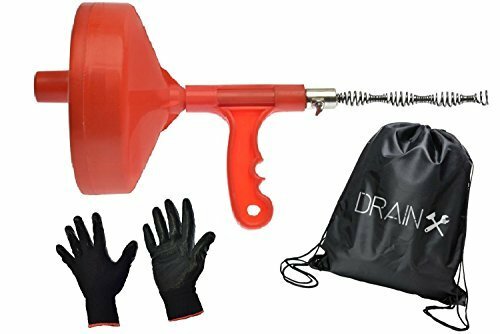 Works great for bathtub drain, bathroom drain, shower drain, kitchen sink, downspouts, central vacuums, and sewer drains  Before using the drum auger please use gloves and proper eye wear to prevent any injuries Easy Work Gloves and Drawstring Carrying Pouch Included. Great for use in plumbing all drains including kitchen and bathroom sinks, toilets, bathtubs, showers, and drainage pipes. Instruction manual is visible on this page. 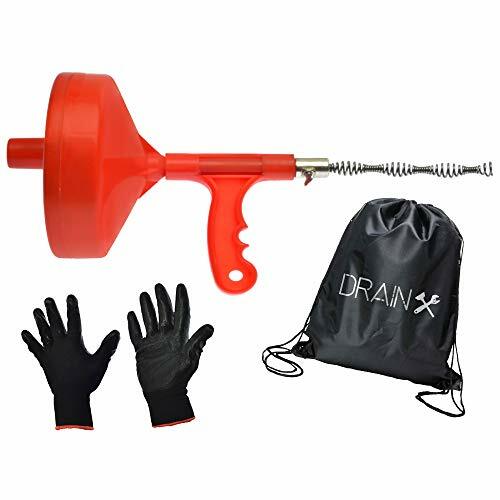 100% Money Back Guarantee: Buy our Drum Auger without risk! We guarantee your complete satisfaction, or your money back. Hassle-free returns.